I suppose comfort food is the stuff you love best and that makes you feel at home. For me, it’s Mexican food of almost any sort. Because it’s hard to find here, I have reverted back to cooking my own again. Most of my recipes are not exactly haute cuisine and maybe not even totally authentic, but I liked them, and apparently so did my kids. One of my sons called and requested my enchilada casserole recipe the other day. When I first had the idea for this blog it was to have a place to share my old recipes with my sons and their wives so that they could always eat those things they grew up with. So, my son’s call was a little like comfort food to me. 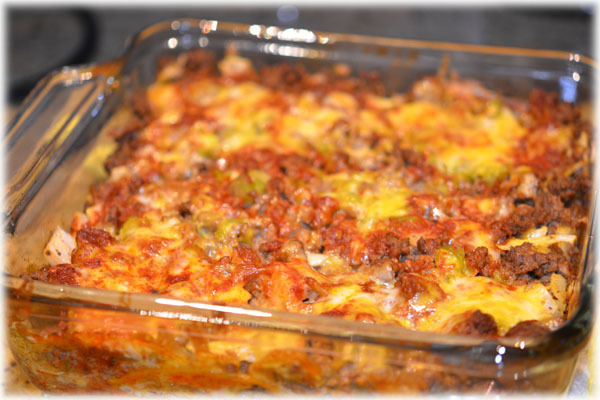 Here is my recipe for Enchilada Casserole. It is something I made all of the time, not always the same, because I never really used a recipe. If you are out of the right kind of cheese you can substitute within reason (cheddar will actually work, altho I don’t like it quite as well). It froze well and the leftovers (if they existed) were never turned down for a lunch or dinner even the next day. BTW this is not wheat free. I have not tried to find a wheat free enchilada sauce. You can make your own too, which is not all that difficult, but one of the wonderful things about this recipe is you can put it together in a short time and have dinner on the table quickly.